Shiga toxin-producing Escherichia coli (STEC) is an important cause of bloody diarrhoea (BD), non-bloody diarrhoea (NBD) and the haemolytic uraemic syndrome (HUS). In Argentina and New Zealand, the most prevalent STEC serotype is O157:H7, which is responsible for the majority of HUS cases. In Australia, on the other hand, STEC O157:H7 is associated with a minority of HUS cases. The main aims of this study were to compare the phenotypic and genotypic characteristics of STEC O157 strains isolated between 1993 and 1996 from humans in Argentina, Australia and New Zealand, and to establish their clonal relatedness. Seventy-three O157 STEC strains, isolated from HUS (n = 36), BD (n = 20), NBD (n = 10), or unspecified conditions (n = 7) in Argentina, Australia and New Zealand, were analysed. The strains were confirmed to be E. coli O157 by biochemical tests and serotyping. A multiplex polymerase chain reaction (PCR) was used to amplify the stx1, stx2 and rfbO157 genes and a genotyping method based on PCR-RFLP was used to determine stx1 and stx2 variants. This analysis revealed that the most frequent stx genotypes were stx2/stx2c (vh-a) (91%) in Argentina, stx2 (89%) in New Zealand, and stx1/stx2 (30%) in Australia. No stx1-postive strains were identified in Argentina or New Zealand. All strains harboured the eae gene and 72 strains produced enterohaemolysin (EHEC-Hly). The clonal relatedness of strains was investigated by phage typing and pulsed-field gel electrophoresis (PFGE). The most frequent phage types (PT) identified in Argentinian, Australian, and New Zealand strains were PT49 (n = 12), PT14 (n = 9), and PT2 (n = 15), respectively. Forty-six different patterns were obtained by XbaI-PFGE; 37 strains were grouped in 10 clusters and 36 strains showed unique patterns. Most clusters could be further subdivided by BlnI-PFGE. STEC O157 strains isolated in Argentina, Australia, and New Zealand differed from each other in terms of stx-genotype and phage type. Additionally, no common PFGE patterns were found in strains isolated in the three countries. International collaborative studies of the type reported here are needed to detect and monitor potentially hypervirulent STEC clones. Shiga toxin-producing Escherichia coli (STEC) is an important emerging pathogen which can cause bloody diarrhoea (BD), non-bloody diarrhoea (NBD) and the haemolytic uraemic syndrome (HUS). The ability of STEC strains to cause severe disease in humans is related to their capacity to secrete Shiga toxins, Stx1 and Stx2, and variants of these toxins [1, 2]. Another virulence-associated factor of most STEC isolates associated with severe disease is intimin, a 94-kDa outer membrane protein, which is encoded by the eae gene on a ca. 34-kb chromosomal pathogenicity island termed the locus of enterocyte effacement (LEE). This locus is associated with the intimate adherence of E. coli to epithelial cells, initiation of host signal transduction pathways, and the formation of attaching-and-effacing intestinal lesions . In addition, most STEC strains associated with BD or HUS produce an enterohaemolysin (EHEC-Hly), encoded by a plasmid-borne gene, known as ehxA . Argentina has a high incidence of HUS: 13.9 cases per 100,000 children younger than 5 years old were reported in 2005 . This rate is 10-fold higher than in other industrialised countries . In Argentina STEC is the primary aetiological agent of HUS, and E. coli O157:H7 is the predominant serotype isolated . In Australia and New Zealand the annual incidence of HUS, determined through active surveillance, is approximately 1.0 to 1.3 per 100,000 children less than 5 years old . Interestingly, the predominant STEC serotypes associated with HUS in these two countries differs. Whereas in New Zealand O157 strains make up around half of the isolates, in Australia serotype O111 STEC account for most HUS cases, with O157 associated with fewer than 20% [8, 9]. The reasons for these differences are not known. The aims of this study were to compare the phenotypic and genotypic characteristics of STEC O157 strains isolated from humans in Argentina, Australia and New Zealand during the period 1993–1996, and to establish the genetic diversity and clonal relatedness among the strains isolated in these three countries. The rationale for undertaking this study was based upon national and international concerns that modern centralised and rapid food distribution systems in these countries together with recent increases in the volume of food trade internationally and the enormous increase in global travel could allow the unfettered, and undetected, worldwide spread of virulent clones of STEC O157. Of the 73 strains examined (35 from Argentina, 20 from Australia and 18 from New Zealand), 36 were isolated from HUS cases, 20 from BD cases, and 10 from NBD cases. The clinical origin of 7 strains was not specified (Table 1). All strains were confirmed as E. coli O157, were cytotoxic for Vero cells, and carried the genes encoding intimin and fliCH7, even though several were non-motile in vitro, and were typed as O157:H- (data not shown). Production of enterohaemolysin was observed in 72 (98.6%) of 73 strains, in agreement with the polymerase chain reaction (PCR) results. Clinical presentation of patients in Argentina, Australia, and New Zealand from whom STEC O157 strains were isolated between 1993 and 1996. PCR-restriction fragment length polymorphism (RFLP) genotyping of the 73 O157 STEC strains showed that 35 (48%) strains harboured stx2 and stx2c (vh-a), 22 (30%) carried only stx2, 6 (8%) carried stx1 and stx2, 4 (5%) carried stx1 and stx2c (vh-a), 3 (4%) carried only stx2c (vh-a), 2 (3%) carried only stx1 and 1 (1%) carried stx1 and stx2-UT (Table 2). The most frequent stx genotypes were stx2 and stx2c (vh-a) (32/35; 91%) in Argentina, stx1 and stx2 (6/20; 30%) in Australia, and stx2(16/18; 89%) in New Zealand. stx2 was the only stx-genotype found in all 3 countries. No stx1-positive strains were obtained from patients in Argentina or New Zealand, compared with 13 of 20 from Australia (P < 0.0001; Fisher's exact test, two-tailed). Of the 13 stx1-positive strains isolated in Australia, however, 11 were also positive for stx2 or stx2c. Notwithstanding these difference in toxin profile, there was no significant association between stx genotype and the clinical presentation of the patient from whom the strain was obtained (Table 3; P > 0.5, Kruskal-Wallis test). stx genotype of STEC O157 strains isolated between 1993 and 1996 from humans in Argentina, Australia and New Zealand. Distribution of STEC O157 strains isolated from humans with haemolytic uraemic syndrome (HUS), bloody diarrhoea (BD), non-bloody diarrhoea (NBD) or other non-specified conditions (NS) according to stx genotype. The most frequent phage types (PT) identified in Argentina, Australia, and New Zealand were PT49 (12/35; 34%), PT14 (9/20; 45%), and PT2 (15/18; 83%), respectively (Table 4). PT4 was the only PT found in all 3 countries with frequencies of 31% (11/35) in Argentina; 15% (3/20) in Australia, and 11% (2/18) in New Zealand. There was no significant association between phage type and the clinical presentation of the patient from whom the strain was obtained (P > 0.5, Kruskal-Wallis test). Phage type of STEC O157 strains isolated between 1993 and 1996 from humans in Argentina, Australia and New Zealand. Pulsed-field gel electrophoresis (PFGE) of XbaI-digested genomic DNA was used to subtype all 73 STEC O157 strains, generating 46 distinct PFGE patterns with 16–24 discernible fragments, ranging from approximately 32 to 730 kb in size. Twenty-one patterns were identified amongst 35 strains isolated in Argentina, 14 patterns in 20 strains from Australia, and 11 patterns in 18 strains from New Zealand. Ten clusters contained isolates with indistinguishable XbaI-PFGE profiles (Figure 1). These were cluster I (3 strains from Argentina); cluster II (3 strains from Australia); cluster III (2 strains from Argentina); cluster IV (5 strains from Argentina); cluster V (2 strains from New Zealand); cluster VI (8 strains from Argentina); cluster VII (2 strains from New Zealand); cluster VIII (4 strains from New Zealand); cluster IX (3 strains from New Zealand); and cluster X (5 strains from Australia). To refine the cluster analysis further, we determined the BlnI-PFGE profile of each isolate. This revealed that most strains with identical XbaI-PFGE pattern could be discerned from each other by restriction with a second enzyme (Table 5). Some clusters could also be split by using phage typing and stx genotyping (Table 5). Only two clusters, II (3 strains) and X (5 strains), both from Australia, were indistinguishable by XbaI- and BlnI-PFGE, phage typing and stx-genotyping, indicating that these were probable clones. 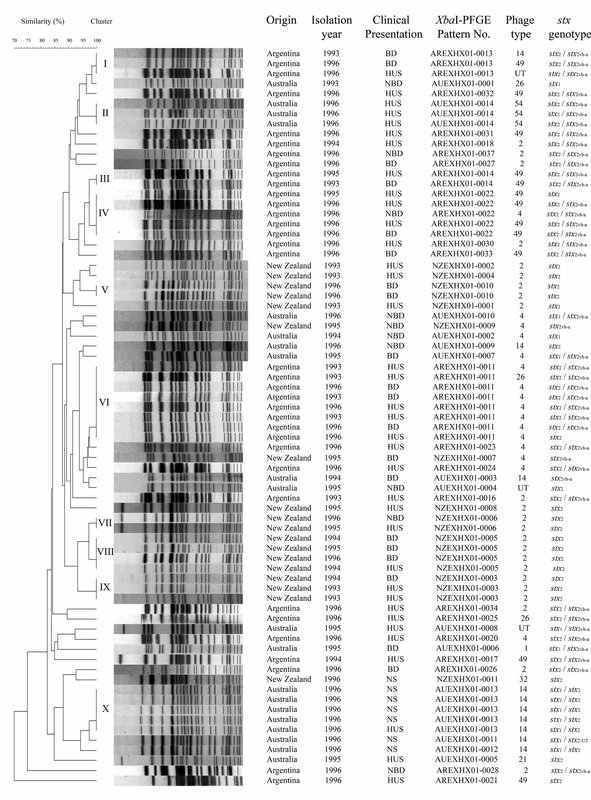 Clonal relationship of 73 STEC O157 strains isolated between 1993 and 1996 from humans in Argentina, Australia, and New Zealand. Discrimination of STEC O157 strains within XbaI-PFGE clusters by phage type, stx genotype and BlnI-PFGE. In Argentina, the predominant XbaI-PFGE patterns were AREXHX01-0011 (cluster VI, 8 strains), AREXHX01-0022 (cluster IV, 5 strains), AREXHX01-0013 (cluster I, 3 strains) and AREXHX01-0014 (cluster III, strains). The eight strains in cluster VI were recovered from three HUS cases and one BD case in 1993. and from two HUS cases and two BD cases in 1996. All of these isolates carried stx2 and stx2c (vh-a), except one strain isolated from a patient with HUS which carried stx2 only. Seven strains belonged to PT4, and one to PT26. Four of the five strains in cluster IV carried stx2 and stx2c (vh-a). Four strains in this cluster were isolated from one case each of NBD, BD, and two of HUS in 1996. Three of these strains belonged to PT49, and one to PT4. The three stx2/stx2c (vh-a) PT49 strains in this cluster showed the same pattern on BlnI-PFGE and are likely to be a clone. The remaining strain in this cluster carried stx2, belonged to PT49, and was recovered from an HUS case in 1995. The three strains in cluster I carried stx2 and stx2c (vh-a) and were isolated from a BD case in 1993, and from a BD and a HUS case in 1996. All three belonged to different PTs (PT49, PT14, and PT-UT). The two strains in cluster III, carried stx2 and stx2c (vh-a), belonged to PT49 and were isolated from a BD case in 1993, and an HUS case in 1995. In Australia, the predominant XbaI-PFGE patterns were AUEXHX01-0013 (cluster X, 5 strains), and AUEXHX01-0014 (cluster II, 3 strains). All five strains in cluster X carried stx1 and stx2, belonged to PT14, and were isolated in 1996 from one HUS case, two contacts of this case and from two individuals with an unspecified disease other than HUS or diarrhoea. These strains also showed the same BlnI-PFGE pattern (Table 5). All three strains in cluster II carried stx2 and stx2c (vh-a), belonged to PT54 and were isolated from HUS cases in 1996. The strains were also indistinguishable by BlnI-PFGE. The only enterohaemolysin-negative strain in this study carried stx2 alone, belonged to PT21 and was isolated from a HUS case in 1995. In New Zealand, the predominant XbaI-PFGE patterns were NZEXHX01-0005 (cluster VIII, 4 strains), NZEXHX01-0003 (cluster IX, 3 strains), NZEXHX01-0010 (cluster V, 2 strains), and NZEXHX01-0006 (cluster VII, 2 strains). The four strains in cluster VIII were isolated from BD cases in 1994, 1995 and 1996, and from a HUS case in 1994. The three strains in cluster IX were obtained from two HUS cases in 1993 and one case of BD in 1994. The two strains in cluster V were isolated from BD cases in 1996, and the two strains in cluster VII were isolated from an HUS case in 1995 and a NBD case in 1996. All 11 strains harboured stx2 and were the same phage type (PT2). This study revealed differences in the stx genotype, phage type and PFGE profiles of clinically-significant STEC O157 strains isolated from humans in Argentina, Australia and New Zealand. Strains that possessed both stx1 and stx2 were relatively more prevalent in Australia as is the case in the USA , Japan  and Chile , amongst others. On the other hand, the relatively high prevalence of stx2-positive strains in New Zealand resembles the toxin profile of STEC O157 in Western Europe [13, 14]. In Argentina, all isolates were either stx2 or and stx2/stx2c (vh-a), with stx2/stx2c (vh-a) strains accounting for more than 90% of isolates. This highly virulent genotype has been described by Nishikawa et al. as being associated with severe human disease. The high frequency of this toxin profile in isolates from Argentina, and that of Stx2-producing STEC in New Zealand, which are also reportedly more virulent than other strains , compared with Australia (Table 2), may account in part for the relatively low frequency of severe infection with STEC O157 in Australia compared with the other countries. Our finding that stx profile was not significantly associated with clinical presentation, may have been due to a sampling error, in that isolates from the sickest patients are more likely to be sent to reference laboratories for characterisation. At least 90 phage types have been reported for STEC O157 , but only four of these (PT2, PT4, PT14, and PT49) accounted for 84% of the strains analysed in this study. In Europe and Canada, PT2, PT4, PT8, PT14, PT21, PT32, and PT54 account for the majority (> 75%) of STEC O157 strains obtained from humans . Six of these PTs (PT2, PT4, PT14, PT21, PT32, and PT54), were identified in the present study, but only PT4 occurred in all three countries. PT2 and PT8 predominate among human strains of STEC O157 in Spain, Belgium, Finland, Germany, Italy, England and Scotland [17, 19]. In our study, PT2 was predominant in New Zealand strains, and also was identified among the Argentinian strains, but not in Australian strains. PT8 was not identified in this study. PT14, predominant in Canada , was identified in Argentinian and Australian strains, but not in those from New Zealand. PT49 and PT4 were common in Argentina, but absent (PT49) or infrequent (PT4) in Australia and New Zealand. PFGE is the ''gold standard'' of genetic fingerprinting methods for E. coli O157 and is particularly useful for tracking outbreak strains . In this study a high degree of diversity was observed among the strains analysed by this technique. No common XbaI-PFGE pattern was found in strains isolated in Argentina, Australia or New Zealand. However, different clusters were detected in each country. The predominant XbaI-PFGE patterns were: AREXHX01-0011 (8 strains) in Argentina, AUEXHX01-0013 (5 strains) in Australia and NZEXHX01-0005 (4 strains) in New Zealand. The EXHX01-0011 and EXHX01-0022 patterns that were frequent in this study are common within the Argentinian Database, comprising 30% of the STEC O157 isolates detected in different regions of Argentina during the last 10 years . AREXHX01-0011 is indistinguishable from EXHX01-0047, the second most common pattern in the US national database, accounting for approximately 4.6% of strains. The most recent multi-state outbreak with a strain of this pattern occurred in 2003 and was linked to beef, resulting in a food recall . All but two of the XbaI-PFGE clusters could be subdivided by one or more of stx genotyping, phage typing and BlnI-PFGE (Table 5). Those which could not be subdivided in this way included three strains that were epidemiologically related, and others that may have been responsible for small, undetected community outbreaks of infection. In the absence of pertinent data about the patients from whom these strains were obtained, however, we were unable to test this hypothesis. The 73 STEC O157 strains isolated between 1993 and 1996 from symptomatic humans in Argentina, Australia and New Zealand differed in terms of stx-genotype and phage type. No common XbaI-PFGE pattern was found in the strains isolated in the three countries, indicating that there up until 1996 there was little spread of STEC O157 between them. Most isolates with common XbaI-PFGE patterns could be distinguished form each other by stx genotyping, phage typing or BlnI-PFGE. By conducting international collaborative studies, using standardised detection and typing tools of the type reported here, reference laboratories will be able to detect the emergence of potentially hypervirulent STEC clones and monitor their spread. All 73 E. coli O157 strains of human origin submitted to the relevant microbiology reference laboratories in Argentina, Australia and New Zealand between 1993 and 1996 were studied. Each strain represented a single isolate from a particular patient and none was associated with a recognised outbreak. The 35 Argentinian strains were submitted to the National Reference Laboratory by different hospitals. The 20 Australian and 18 New Zealand strains were submitted by various diagnostic laboratories in both countries to the Department of Microbiology and Immunology, University of Melbourne, for confirmation of their identity and further characterisation. In keeping with the guidelines of our human ethics committees, all strains were coded to protect patient confidentiality. The distribution of strains isolated from patients in Argentina, Australia, and New Zealand by clinical presentation is shown in Table 1. All strains were confirmed to be E. coli O157 by biochemical tests , and serotyping using somatic and flagellar antisera obtained from the Instituto Nacional de Producción de Biológicos – ANLIS "Dr. Carlos G. Malbrán" . The presence of stx1, stx2 and rfbO157 was determined by means of a multiplex PCR . The reference E. coli strains, EDL933 O157:H7 (stx1, stx2), and non-pathogenic E. coli ATCC 25922 were used as positive and negative controls, respectively. Enterohaemolysin production was detected on sheep blood agar plates . To determine Stx production, bacterial supernatant and periplasmic cell extracts were used in cytotoxicity assays on Vero cells  using Stx1- and Stx2- specific monoclonal antibodies (MAb 13C4 and BC5BB12, respectively) kindly provided by Dr. N. A. Strockbine, Centers for Disease Control and Prevention, Atlanta, GA, USA. Additional virulence markers were characterised by PCR. The intimin (eae) and ehxA genes were detected by PCR [4, 27]. The presence of the fliCH7 gene was tested as described by Gannon et al. .
Genotyping of stx2 variants was done by RFLP analysis of the B-subunit-encoding DNA fragments obtained by PCR  and extended to include primers and restriction enzymes as described by Pierard et al. . The reference E. coli strains 92–3580 O157:H7 (stx2vh-a) and 93–016 O113:H21 (stx2vh-b) were kindly provided by Dr. D. Woodward, of the National Microbiology Laboratory, Public Health Agency ofCanada, Winnipeg, Manitoba, Canada. stx1 variants were identified by RFLP and PCR . Phage typing was performed by the method originally described by Ahmed et al. and extended by Khakhria et al. . The E. coli O157 typing phages used were kindly provided by R. Ahmed, of the National Microbiology Laboratory, Winnipeg, Manitoba, Canada. Macrorestriction fragment analysis by PFGE was performed using the 24-h PulseNet standardised PFGE protocol for E. coli O157:H7  with minor modifications. Restriction digestion of DNA embedded in plugs was performed with 30 U of XbaI or BlnI (Promega Corp., Madison, WI, USA) at 37°C overnight. The PulseNet size standard strain used was Salmonella Braenderup H9812 (kindly provided by the Centers for Disease Control, Atlanta, GA, USA). DNA fragments were resolved in 1% pulsed-field SeaKem Gold agarose (FMC Bioproducts, Rockland, ME, USA) in 0.5× TBE buffer at 14°C. PFGE was performed using a CHEF DR-III system (Bio-Rad Laboratories, Hercules, CA, USA), using a linear pulse ramp of 2.2–54.2 sec with a run length of 18 h and a constant voltage of 200 V. Images of gels were obtained using a Gel Doc 2000 (Bio-Rad Laboratories). Analysis of TIFF images was performed using the BioNumerics software package (Applied Maths, Kortrijk, Belgium) using the Dice coefficient and UPGMA to generate dendrograms with 1.5% tolerance values. The clonal relationship analysis was confirmed visually. Statistical analysis of data was performed using InStat version 3.05 (GraphPad Software Inc., San Diego, CA, USA). This study was supported by grant from Fundación Alberto J. Roemmers Argentina and the Australian National Health and Medical Research Council. ST was the recipient of a JN Peters Bequest Fellowship from The University of Melbourne. GAL and EME performed the detection of virulence genes by PCR, the typing of the stx genes by RFLP-PCR and XbaI-PFGE. EM was the responsible for the phage typing and the cytotoxicity assays on Vero cells. GAL and IC carried out the analysis of the PFGE results. MR designed the study and, together with GAL, drafted the manuscript. KA, ST and RRB were involved in the initial isolation and characterisation of the Australian and New Zealand strains. RRB prepared the final version of the manuscript together with GAL and MR. All authors read, commented on and approved the final manuscript.